The search continues for 2 year old Daisy Jo Holland who has been missing since Friday night, May 24 at the Wapiti Park Campground in Elk River, Minnesota. The search has moved to the water as authorities are searching the Elk River and nearby Lake Orono for the missing two year old. Several hundred people searched around the campground on Saturday, but Sunday’s effort will only be with law enforcement, and focus on the river. Volunteers were not needed. Elk River Police and the Sherburne County Sheriff’s Office have been on the scene since 8 a.m. Sunday morning. Police Chief Brad Rolfe said it is considered an “active” search. “Obviously she was last seen very near the river, but we continue to look in all directions just out of an abundance of caution and we want to be thorough in this investigation,” Rolfe said. Better conditions have allowed crews to get boats and divers on the water. He said the river current is strong and there is debris in it as well, making conditions difficult for divers. 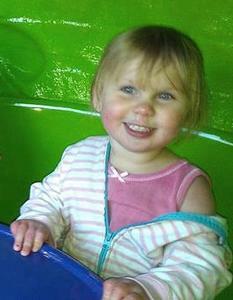 UPDATE I: Sad news to report in the search for little 2 year old Daisy Jo Holland. Her body was found by divers this after noon. Rest in Peace little one. The girl was found by divers several hundred yards from her campsite. Authorities recovered the body of 2-year-old Daisy Jo Holland on Sunday afternoon, nearly two days after she vanished from a campground in Elk River. She was found by dive team members about 2:30 p.m. several hundred yards from her campsite, downstream in the Elk River near Wapiti Park Campground. The search on Sunday focused on the river and Orono Lake. “The active search for Daisy has concluded,” said Elk River Police Chief Bradley Rolfe. UPDATE II: At a press conference held at 5 p.m., Elk River Police Chief Brad Rolfe said the body is similar to the description of Holland. Dive team members found the body several hundred yards downstream, and it has since been taken to the Ramsey County Medical Examiner’s Office to be positively identified. The medical examiner’s office will also work to determine the cause of death, but investigators say there is no indication of foul play at this time. Two year old Daisy Jo Holland has been missing since Friday night, May 24, 2013 around 8:00 pm at the Wapiti Park Campground near the Elk River in Elk River, Minnesota. Elk River Police Chief says several children, including Holland, were playing while parents set up camp around 8 p.m. Friday when suddenly the child was out of sight. The campground is located at 18746 Troy Street in Elk River, MN. The Elk River Police Department. Crews were searching both the campgrounds and nearby Elk River Friday and Saturday morning. According to Sheriff’s officials, dogs have tracked her scent to the edge of the Elk River. Last seen wearing black pants and a pink shirt that imprinted with “Hello Kitty”. UPDATE I: The search continues for missing 2 year old Daisy Jo Holland. We can only hope that the toddler wandered into the woods, rather than falling into the river. Crews began searching the campground area and river Friday night. Early Saturday, the focus of the search shifted to an area along the river bank where search dogs picked up a scent about 200 yards from where the family was camping. A dive team has been called in to search the river. UPDATE II: Hundreds of volunteers help look for tot missing from Elk River campsite. Hundreds of volunteers and rescue workers are combing the water and woods near an Elk River campground, searching for a two-year-old girl who went missing Friday night. Boats with divers are on a stretch of the Elk River that flows by the Wapiti Park Campground where Daisy Jo Holland was staying with family and friends before disappearing at about 8 p.m. A steep and eroded bank overlooks the river near the campsites and officials said Saturday morning that dogs had followed Daisy’s scent to the river’s edge. Residents from Sherburne County and beyond responded to word of the missing toddler, gathering at the Gateway Church on the west edge of town, where authorities organized search parties to flood the fields and forests adjoining the private campground. UPDATE III: Police plan to search river, lake for missing 2-year-old. Authorities plan to focus on efforts to search the water for missing 2 year old Daisy Jo Holland. They say they have extensively searched on land and they plan on Sunday to continue searching the Elk River and nearby Orono Lake. Also, authorities stated that they have no information that leads them to believe Daisy was abducted or foul play was involved. Police say they will continue searching the Elk River and nearby Orono Lake on Sunday for a missing 2-year-old girl. On Sunday, police said divers and other agencies will focus most of their efforts on searching the water. They say the ground area was extensively searched on Saturday, and no further ground searches are planned. They say volunteer groups are not needed at this time. Authorities say they are looking at all scenarios, but they have no information that leads them to believe Daisy was abducted or foul play was involved. Dogs brought in to help in the search made strong indications of Daisy’s scent near the riverbank. UPDATE IV: There is very sad news to report, the body of two year old Daisy Jo Holland was found by divers deceased today at 2:30 pm. Our prayer and condolences to go out to the family and friends of this precious little girl. Rest in Peace Daisy Jo. For more updates, comments and individual’s analysis, go to Scared Monkeys Missing Persons Forum: Daisy Jo Holland. If anyone has any information regarding Daisy’s whereabouts is asked to call Sherburne County Dispatch at 763-765-3595.